Hello everyone! 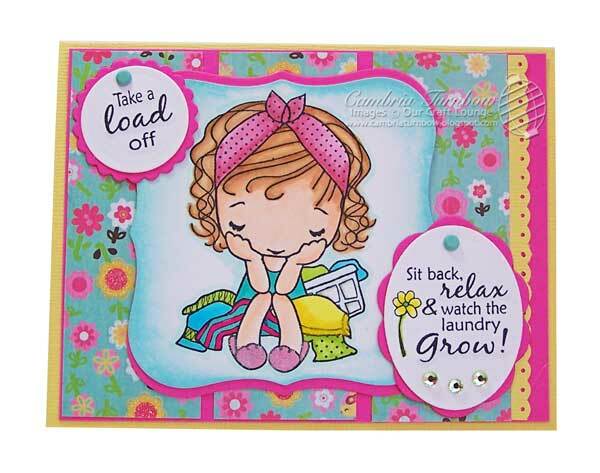 Welcome to the OCL Sneak Peek Blog Hop! You should have arrived from Amber Hillman's blog. If you didn't arrive from Amber's blog, click here to start the blog hop and have a chance to win one of these fun new sets from Our Craft Lounge. 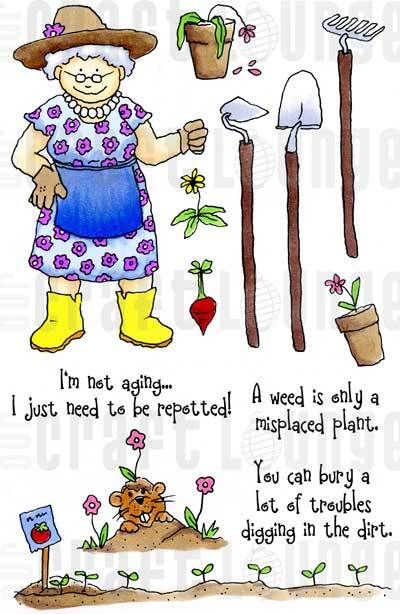 This set is called Growin' with Granny! You all know how much I adore Granny... I cannot resist her. She always makes me smile. 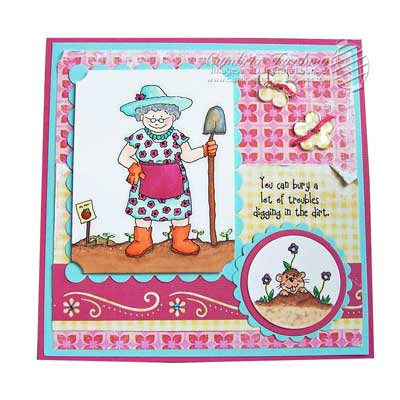 And, who could resist that gopher! Ready for more? Next, you'll want to visit Deb Felts... I cannot wait to see what she did! I always love her work! Click here.... Thanks for stopping by! Don't forget to leave a comment for a chance to win! Hello Stampers! Once again, I'm sorry it's been so long. I have to say, that 2010 was one of the hardest years of my life. I'm looking forward to 2011 being MUCH better! I hope 2011 is awesome for you!! Happy belated New Year wishes! I'm starting off this month with a class down at Memories of Time with my friend Kisa. 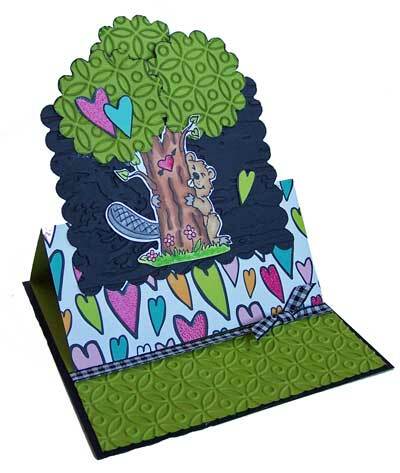 Kisa designed this awesome card out of the stump in the set called Bub's the Beaver. She is brilliant I tell yah. 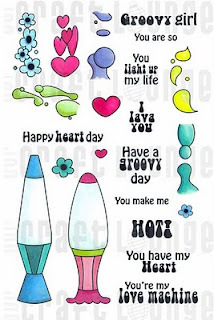 We'll also being doing a Joy Fold card using the set Sending Love. 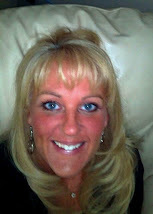 Earlier in the day, I'm helping my friend Tammie with her first class...she is going to rock! Look at these amazing boxes she is teaching!! So, if you are in the Coos Bay/North Bend area, come down, or call to sign up, at Memories of Time for the great classes this Saturday! The fun starts at Noon! We'd love to see you! Have a wonderful week.... thanks for stopping by! I used two stamp sets for these projects. Reindeer Games and No Peeking! The cute gift box is a Sizzix Die... and very easy to put together. 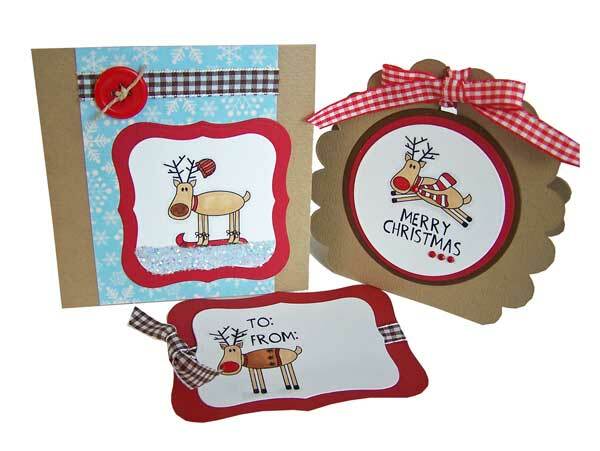 The reindeer nose is covered with Rockin' Red Sparkly Fluff (the gift box) and Brown Sugar Sparkly Fluff (the card). The ground is covered with our Chunky Glitter applied with Glossy Accents. That button is from Fancy Pants and the ribbon is from Bazzill, along with all the cardstock and jewels. 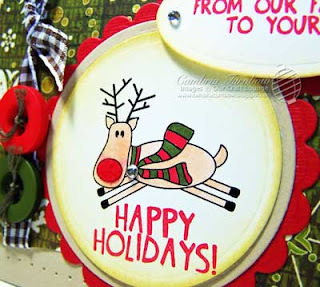 I know I need quick and easy for the holidays... and these cute reindeer are easy to color and oh so cute! :) Have you seen the cute set that goes with this one called Reindeer Pun? Really makes them extra fun huh? Hope you have a wonderful day. It's snowing here on the OR Coast... I told you it was getting cold. The kids were SO bummed that school wasn't canceled. Stay warm! Thanks for stopping by! Good Monday morning! Hope everyone is healthy and warm today... it's getting SO cold here on the OR Coast! I finally had some time to stamp... or should I say, finish stamping. 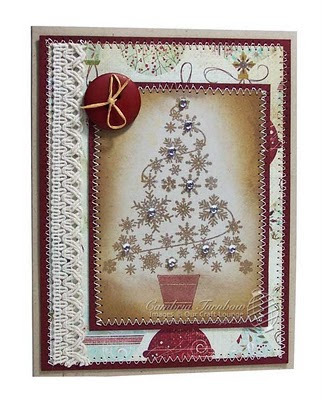 I stamped this tree from the stamp set White Christmas a few weeks ago, and it's been sitting here on my desk just patiently waiting to be turned into a card. I really like how this one turned out. I stamped that tree onto Neenah (I forget the name of the cardstock, but it looks like Kraft. I want to say Sand? 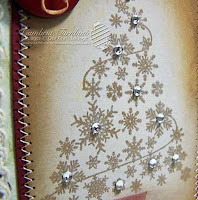 ), with my Versamark Champagne Dazzle ink Pad, then embossed with clear embossing powder. I grabbed a finger dauber and then used white craft ink to smear all around the tree. When I was done, I took a tissue and cleaned off the white ink off the embossed snowflakes. Then, I used my Ranger Sponge Tool and inked up the sided and I'm sorry, but I can't remember what ink I used.. maybe Brushed Corduroy or Antique Linen? I'll be better next time about paying attention.... sorry! 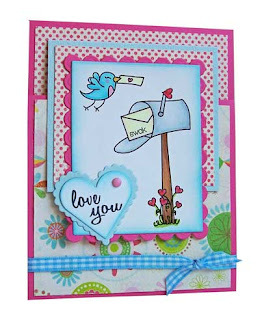 If you are looking for the winner from last week's blog hop, they will all be announced over at The Lounge later today. The set I am giving away will not ship until next week though, so please be patient. Hope you have a wonderful week and a Thanksgiving filled with family and love! Thanks for stopping by! This set is called Lava You. It's SO awesome! All kinds of fun different Lava to stamp in each lamp. Fun sentiments too! In my photo, my lamp is still a little mucky because I was impatient and the Glossy Accents wasn't quite dry. After it completely dries, it will be crystal clear. 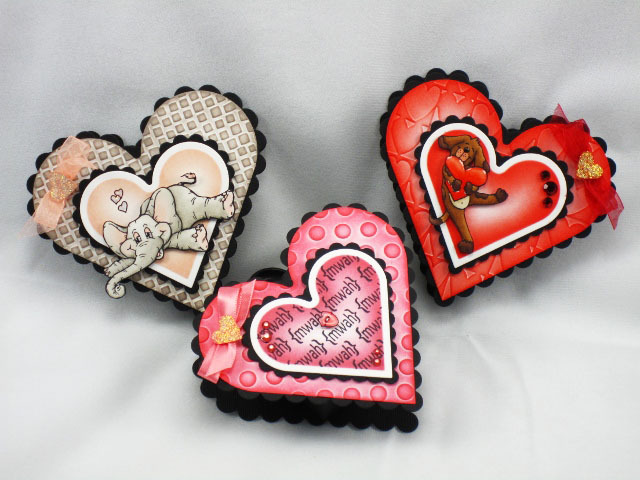 I painted the hearts and surrounding the hearts with Smooch ink. Then, once that was dry, I covered the entire "glass" part with Glossy Accents. I then placed a double sided foam dot from Scrapbook Adhesives under the lamp part before adhering it to the black scallop layer with Zip Dry which made the lamp bulge out even more! You just HAVE to touch it.. really you do. Finished it off by adding some of my favorite jewels from Bazzill... just like their cardstock, their jewels are THE BEST! Would you like to win this set? Just leave a comment here with your contact information, and you have a chance. One winner will be drawn on Sunday. You have until Saturday, midnight to enter. Here are the rules. *shipment of the new sets will take a couple weeks. 3) you will only be eligible to win one new set. Blog candy will be drawn Sunday morning (November 21st) by each blog participant. Winners will be notified by the designer & a full list of winners will be posted on the OCL Blog. 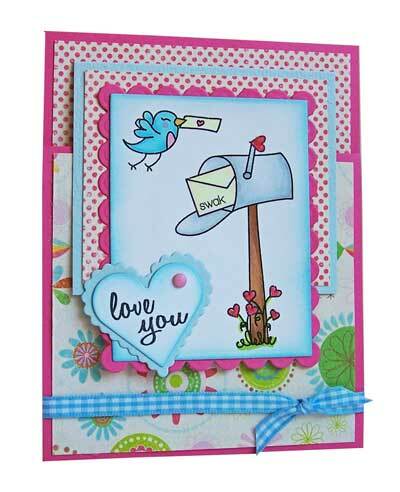 Want more chances to win MORE stamp sets from Our Craft Lounge? Go and visit these other bloggers and leave a comment! Hello everyone! Sorry for my long absence. I hope to be back full time blogging mode soon. It's November, and it marks two years Our Craft Lounge has been in business. Thanks to YOU, it's been a wonderful two years. 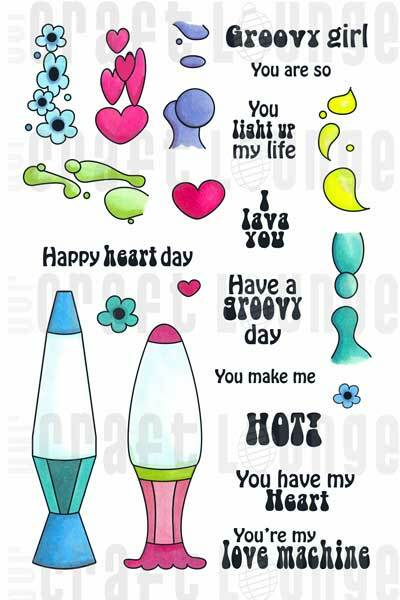 To show our appreciation, we are giving away stamp sets galore! All you have to do to win is leave a comment. Get all the information here. Today, you have a chance to win Jolly Ornaments, so hurry and head over, and if you are a friend at Face Book, make sure you comment there for another chance to win! Have a wonderful day... and thanks for supporting OCL! This sweet image is called Laundry... The Inspiration Emporium carries a ton of adorable Greeting Farm images! 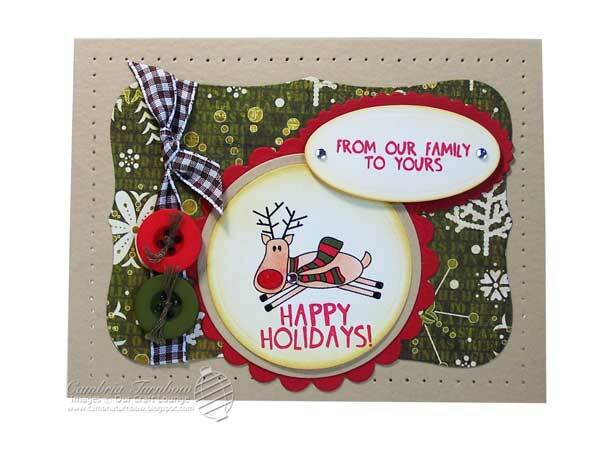 I also used the stamp set, The Spin Cycle by Our Craft Lounge (the sentiments). 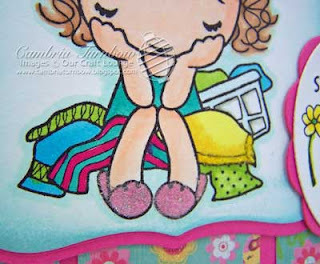 The designer paper is from the Lucy Bird Line (Imaginisce). 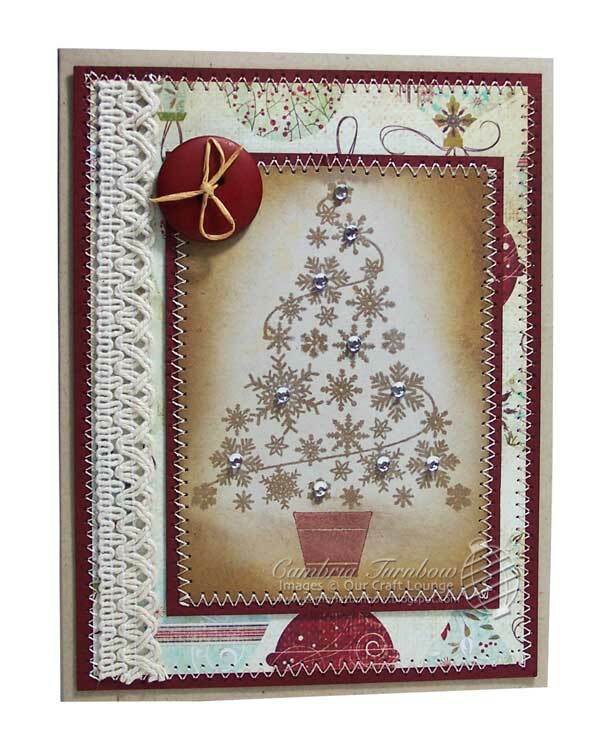 I used Nestability dies from Spellbinders and those jewels are from Bazzill, along with the cardstock. See her cute pink slippers? I just used my Quickie Glue pen, then sprinkled on some Cotton Candy Sparkly Fluff. 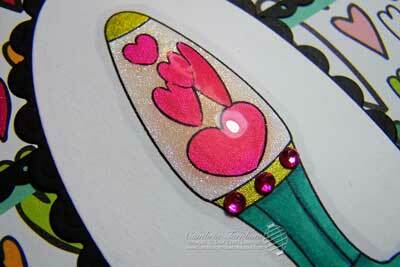 I used Copic Markers to color, and the scalloped edge on the side I made using my EK Success edger punch. Hello Stampers! Wow, it's been a crazy week. All the kids are back to school though, so it's time to buckle down and get some work done for me too. I have to admit, the house was WAY too quiet... I'm sure I'll adjust though *wink*. I really haven't had much stamping time, but I'm hoping with the kids back at school, I'll find some time! We are busy prepping for Scrapfest later this month, so I'm busy cutting, scoring, packing. This week, I grabbed two stamp sets. One called Reindeer Games (love these whimsical reindeer), and No Peeking ( for the sentiments). I added Rockstar Red Sparkly Fluff to the nose, and a jewel from Bazzill to the scarf. On his hoofs, I used my black Sakura Glaze pen. The designer paper and buttons are from the Jovial line (Basicgrey)... oh that paper is yummy. The brown gingham ribbon is from Bazzill, along with the cardstock. I used Antique Linen ink to sponge the edges with my Tim Holtz spongy handle thing. I hope you have a great day! The sun is out today, after a week of rain and clouds on the OR coast, but boy can you feel the Fall coming in the air. Thanks for stopping by!